Last month, Salon del Mobile Milano, otherwise known as Milan Design Week, held it’s annual design show. Founded in 1961, Milan Design Week is now a world-renown furniture exhibition with thousands of exhibitors and hundreds of thousands of guests from over 160 countries. Amidst the thousands of designers that showed their furniture, lighting, and other home furnishing products, one particular collection caught our eye. Christopher Jenner, a London-based award-winning designer from South Africa launched his “Tea House” collection, a contemporary homeware collection that uses Zisha clay from the eastern Chinese province of Jiangsu, in collaboration with Yixing Ceramics. The complete collection includes tea service plates, jugs, vases, and bowls, all using fired Zisha clay. The use of Zisha can be traced back thousands of years to the Northern Song Dynasty, approximately 960-1127 AD. 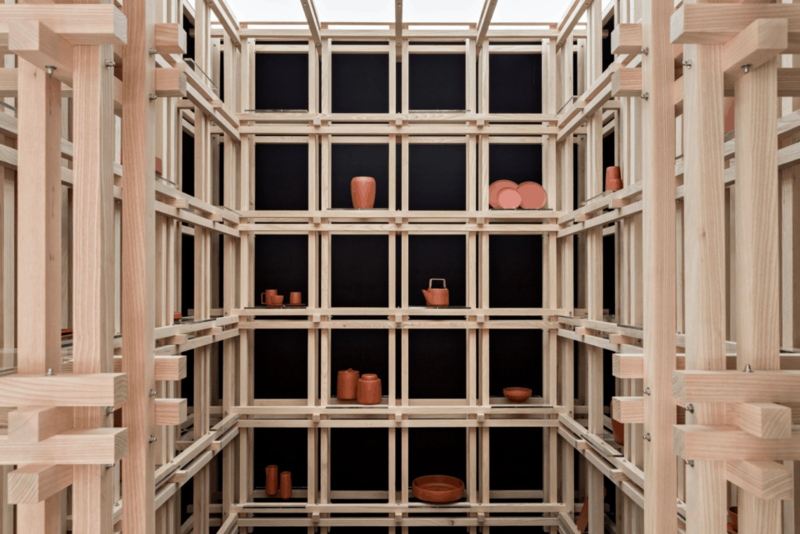 In speaking with Daniel Chen of the Gardiner Museum, Canada’s national ceramics museum, we gained some insight into this centuries-old practice. Zisha, which means “purple sand,” derives its name from its initial purple colour, which is a result of the high iron content in the clay. It is fired into stoneware at 1100-1200 degrees Celsius (2012-2192 Fahrenheit), and typically left unglazed. Once fired, the clay reacts to the heat of the kiln, changing the final colour of the clay. Since the Northern Song Dynasty, the teapots using Zisha clay have been lauded as one of the best for tea brewing – the clay is said to absorb and retain the flavour of the tea, producing a more complex flavour profile over time (it is best, therefore, to only brew one type of tea in a pot, as well as wash it with water only). This mix of ancient Chinese techniques with modern design is not unusual to Chinese ceramics practice, as the use of traditional practices with contemporary design is not uncommon in Chinese history. “Chinese ceramic production consistently references classic forms and decoration while imbuing objects with contemporary qualities. In the Qing dynasty, emperors invested heavily in ceramic production so as to revive earlier techniques dating to the Song dynasty (960-1127 CE). The court’s taste for auspicious symbols meant that many vessels drew inspiration from earlier techniques while combining new and inventive decoration.” – Daniel Chen, Curator of Chinese Ceramics, Gardiner Museum. The length of time to create each piece, Jenner claims, varies depending upon the technique required, “However, they all go through an extensive finishing stage where they’re ‘polished’ to achieve that unique Yixing resonance.” Once the pieces achieve the ‘dry’ stage, they’re fired, which can last from 24-48 hours; a process which greatly affects their texture and colour. 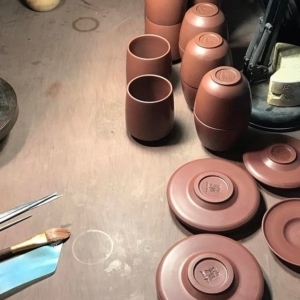 With an emphasis upon honouring the material and craft of Zisha clay within a post-consumer society, Jenner’s collaboration with Yixing ceramics introduces functional heritage pieces that are both sophisticated and timeless. For more Yixing ceramic ware that displays the breadth and scope of Zisha clay, Chen suggests checking out the K.S. Lo Collection, housed at Hong Kong’s Flagstaff House Museum of Tea Ware. If you’d like to see some Chinese and Asian ceramic work locally, the Gardiner Museum houses some pieces such as Hwang Jeng-daw’s “Kissing Jackson” (above, left), and Richard Notkin’s “Ellipsoidal Teapot: Natural Selection” (above, right). The Gardiner Museum is also the home of one of the world’s best collections of Japanese and Japanese-inspired European ceramics.